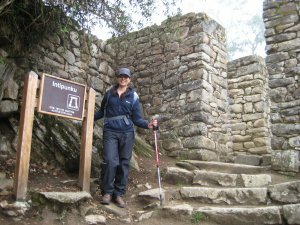 While working through my bluelist, I kept hearing mention of the Inca Trail. I like to walk anyway, and had never been to South America, so I took the rare step of modifying the bluelist, and adding the Inca Trail and Machu Picchu to it. 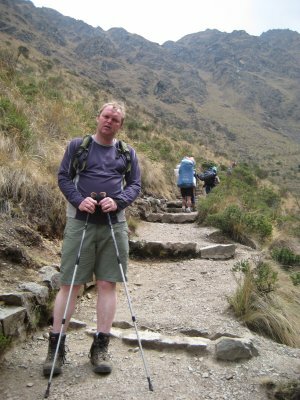 I flew via Amsterdam to Lima, and then From Lima to Cusco. 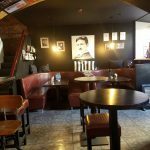 Unfortunately, 6 people had cancelled due to the earthquake, so only 5 of us remained (including Danny Quinn, the stalwart of, Off the Wall in Chester). We set off from Kilometre 86. 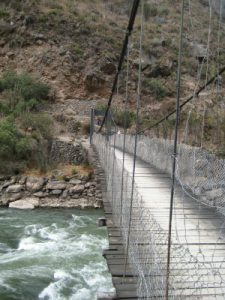 We walk down from the drop off point, cross the railway lines, and then head across this shaky bridge that crosses the Urubamba river. 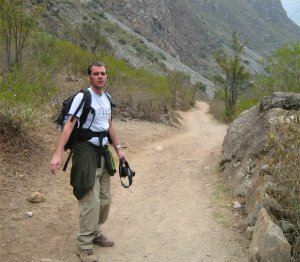 The first part of the trail, wasn’t very steep, and we set of at a cracking pace. I thought that Dan was walking a bit too fast, so I called him back for a photo op. Sadly, the weather wasn’t exactly Malaga. We are passed by the Hiram Bingham train. 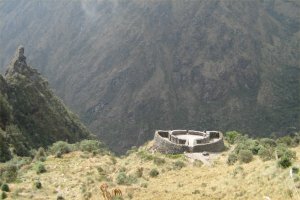 Its a first class train, which travels from Cusco to Machu Picchu, serving cocktails and five course meals. It answered one question I had. Where are the Japanese (I hadn’t seen any the whole morning on the trail). 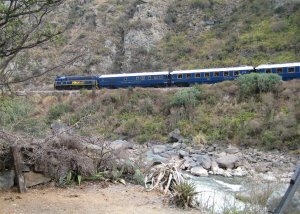 Turns out, they mainly travel on this train, then stay at the mundane hotel, at Machu Picchu itself. The tourist train cost $50, the Hiram Bingham, cost $500. We stop for lunch across from Llaqtapata. Manco Inca Yupanqui, destroyed this, along with a number of settlements along the Inca trail during his retreat from Cusco in 1536. He did this to discourage Spanish pursuit. 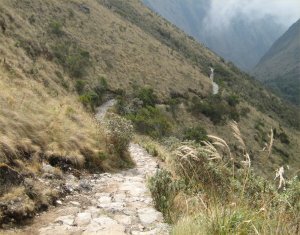 In part due to these efforts, the Spanish never discovered the Inca trail or any of its settlements. 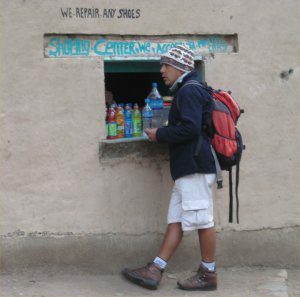 Carlos (our guide) stops to re-supply on water (and we re-supply on Toblerone, Kitkat and other necessities). The shop is optimistically named “Shopping Centre” which I think overstates it a bit. They offered to take Mastercard, which will probably save the odd traveller from hardship. 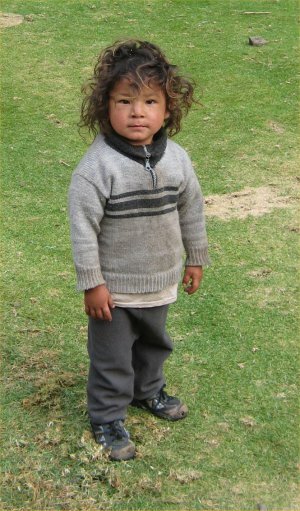 Also, after lunch, Carlos switched from his trainers, to walking boots, and we knew the terrain would get a little rougher. The guidebook had said to be wary of dogs when walking into a village. It said that the locals, will typically throw stones at dogs that bound towards you and try to bite you. It went on to say, that if you couldn’t bring yourself to do that, you should bend over, as though picking up a stone. 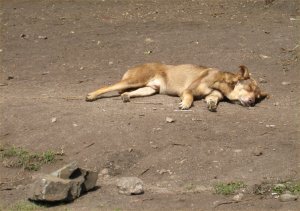 In reality, all the dogs I saw, were like this one. Grade 4, without a care in the world. 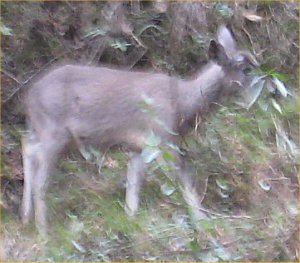 This appalling picture, probably shouldn’t have been put up, but its the closest I have ever got, to actually stalking and photographing a deer. It was in the woods, on the left hand side of the path. We walked up hill some more, walked down into a valley, and then walked out of it again. We arrive at our campsite. There was only us, and one other group staying here, so it was quite nice for the first evening. It also had a turf floor, which was quite comfortable. Dan and I realised that we had been given “Personal” tents. We decided to share one, and let the girls have one each. Here Ashima, unpacks her gear, and works out how to set up all the camping gear she purchased (which has secured the pensions of several salesmen at Blacks outdoor leisure), while Dan’s expression is timeless. The tents weren’t in a particularly straight line. 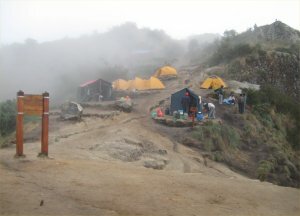 It was still early days in the trip, and we wandered around the camp, just before dinner. 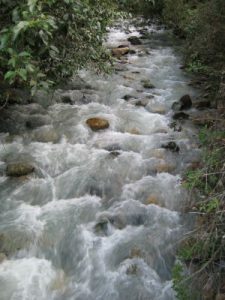 We found this stream with some pretty cool “rapids” which we tried to photograph in artistic ways. This little girl lived near the camp site, and kept coming over to explore. She was really friendly (her older sister sold Bottles of coke and stuff like that). On the morning we set off, she had a go at climbing Ash’s walking poles. We have our “meet your family” ceremony. 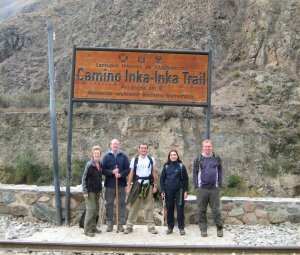 Our Porters, Cook, Lead Porter and Guide take it in turns to introduce themselves, then we do the same. The guy with the hat bending down, is the lead porter. At one point, he teased the small guy in front of him, by using the bag scales to way him (he wasn’t very big, but carried the same weight as everyone else). We all had to say whether we were married, how many children we had etc. Ash was able to speak directly in Spanish (the rest of us had to be translated by the guide) and there was a knowing silence, when Ashima told them that she was single. I told them that I was married for the 2nd time. 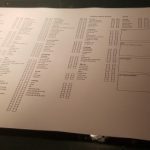 They were all staunch Roman Catholics, it can take years to save for a wedding in Peru, and they seemed shocked and disgusted that someone would get divorced. Once I explained that I came from Manchester (the home of United) they were happy again. 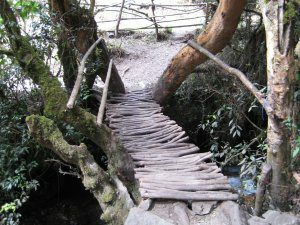 Some of the bridges we crossed were very “Bushcraft” in design (well they would be, they were made by real village dwellers, not computer analysts who pay to go into the woods and learn how to light fires !). 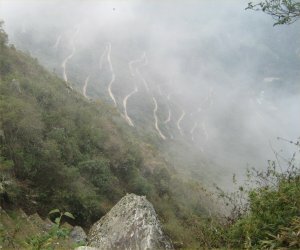 The route along the trail, was very well organised and policed. 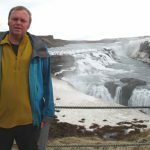 I had actually wondered, whether all the stuff about trekking permits really mattered. We had to pass by a checkpoint and show our passports. Our guide had to show his permit, and the Porters bags had to be weighed. A porter isn’t allowed to carry more than 20kg. This means each of us, can only give them 7kg each to carry. It was quite a problem managing for 5 days with just 7kg of gear, and most of us, put extra stuff in our day packs to compensate. There aren’t many pictures of the 2nd day, as it was physically very demanding (that’s a very euphemistic way of describing it). I was pleased though, that we got it done on the 2nd day. The highest point in the trail, is dead woman’s pass, at 4200m. Most of you will know, that 4000m is a magic number for mountaineers, and here I am photographed reaching that height under my own steam for the first time. After a gruelling couple of hours, I reach the top of the pass. The rest of the group, were already there, and had time to compose themselves. You can see from my expression what was going through my mind. For the previous 45 minutes, I had felt very sick, and I know once I got to the top, I had to get down again pretty quickly. This beautiful path led down through the valley, and into the campsite. Although I was last to the top, I was first to the bottom. I didn’t like this campsite very much as it only had 2 toilets between the whole camp, and felt like we were camped in someone’s living room. The ground was very hard to sleep on, wouldn’t have been a problem normally, but the previous day was very hard, and I needed my sleep. The other thing I couldn’t stand, was camp etiquette. At every campsite I have visited around the world, there is an understanding that you keep the noise down after a certain time. Two woman visiting the toilet at 3am, thought it perfectly okay to walk past our tent and conduct a conversation. Having not slept for more than 45 minutes continuously, I was feeling pretty miserable the next morning. It was raining as we set of walking uphill (much less steep than the previous day). 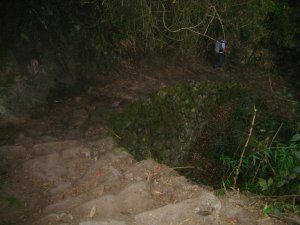 We stop to visit Runcuracay ruins. I correctly guessed that this was of strategic military importance, due to its location in the valley. 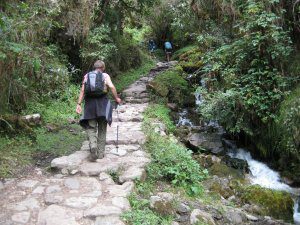 After lunch on the 3rd day, I finally found what I had been looking for on the Inca Trail. 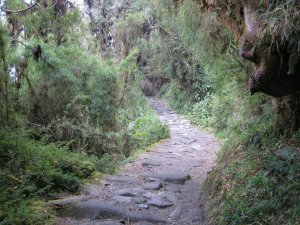 There were beautiful stone paths, high up in the mountains, which led through rainforest. 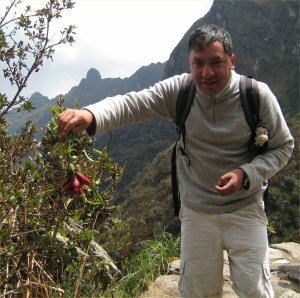 Carlos showed us much of the local plant life. 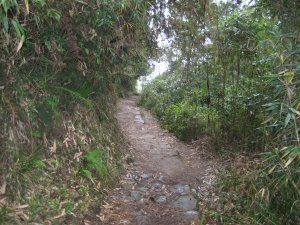 It was explained that the Inca Trail had been secret and sacred. It was designed as a Pilgrimage for high born people to walk, and worship along the way. One novel thing I found, was, if only high born people could walk the trail, who would carry the bags. 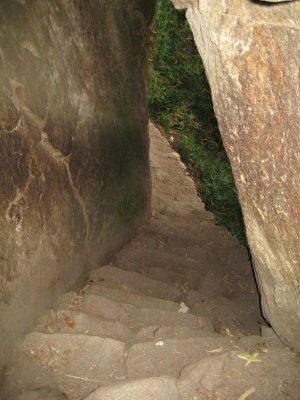 There were points on the trail, where the Inca’s had tunnelled through rock, and carved steps into the stone floor. After much upheaval, a quiet moment of contemplation for me. 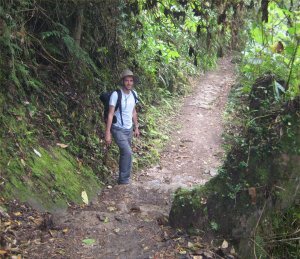 This is what I had always imagined the Inca Trail to be like. 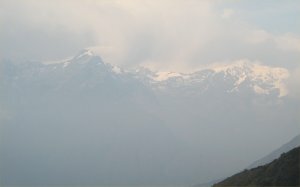 As arrived at our camp, we had a go at photographing a nearby Glacier. The Inca Trail is surrounded by mountain, some of them are nearly 6000m high. 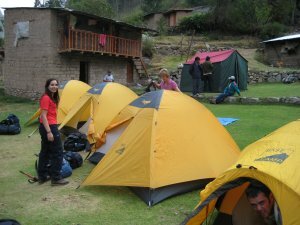 This campsite was much quieter, and it was like our own village. I really wish we had been able to have a campfire , unfortunately, these are banned, and I went to bed at 7:30pm (it was very cold at that altitude). To show how changeable the weather was, take a look at this picture. Ten minutes later, the camp (photographed from the same position) looked like this. Twenty minutes after that, it looked like the first picture again. 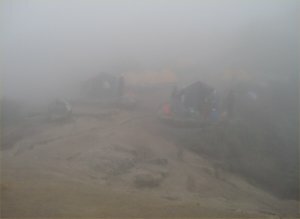 We set of trekking down hill, with the intention of visiting Winawyna for lunch. 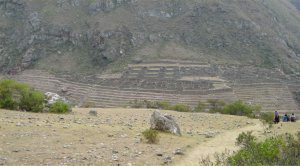 Puyupatamarca, a ruin, very close to our camp site. As we descended into the tree canopy, it became quite dark. 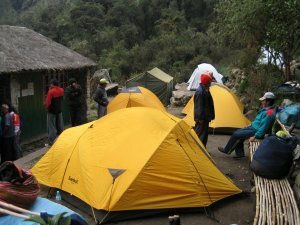 We reach Winaywayna, easily the best facilities of any campsite on the trail, it has a bar and showers. 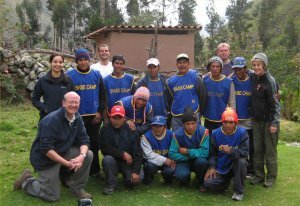 Half our porters had stayed with us until this point, to provide a farewell lunch. 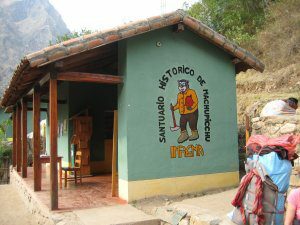 The rest had travelled to Aguas Calientes to deposit our bags at the hotel where we would be spending that night. 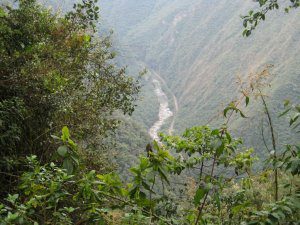 We catch a glimpse of the the Urubamba river, which marked the start of the Trek. After some confusion, and the checkpoint being closed, we set off on the last leg of the trip. 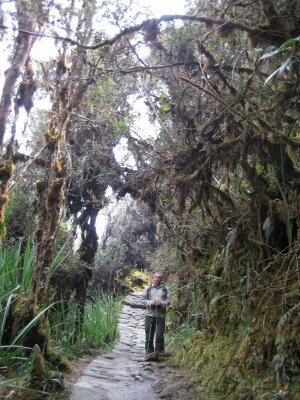 It was uphill, and my legs were still stiff from the ordeal at dead woman pass, but it was with a sense of expectation and achievement that we forged on. 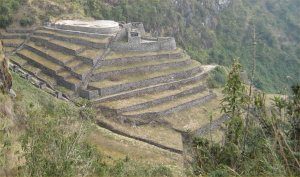 We reach Intipunku, the Sun gate, which overlooks Machu Picchu. By this point, I wasn’t fit to be photographed, so I took a picture of Ash instead (Danny was busy setting up Camera’s and stuff like that). The photo that people always associate with Machu Picchu, is the one taken from the Sungate. Unfortunately, it was very cloudy that day, and this was the best picture I could get. 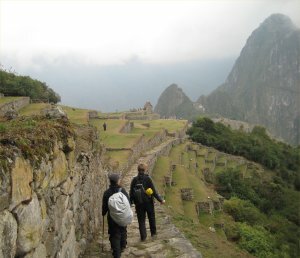 With heightened spirits, we walk down to Machu Picchu to complete the trek. 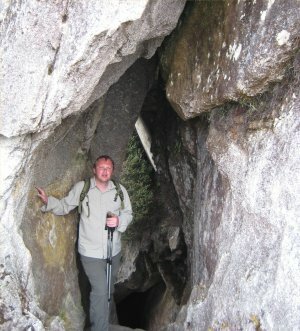 Soaking wet, with more than 151 insect bites, toothache, AMS and boils I finally complete the trek, and stand in the ancient city of Machu Picchu. I said at the time, that I wish I had done the tour, and got the train instead, but on reflection now, I am glad I did it. We had the whole of the next day free to visit Machu Picchu, and our hotel was waiting. After a few minutes to soak up the atmosphere, we board a bus for Aguas Calientes and visit our hotel. I spent the afternoon visiting local monasteries, and finding my “center” after such an enlightening experience. Get real !, this is a John Sunter adventure. 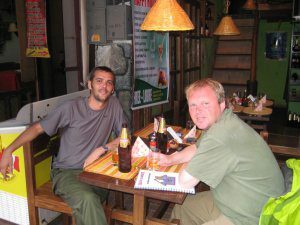 I hooked up with Dan, in a nearby Boozer and we had some Ale !. 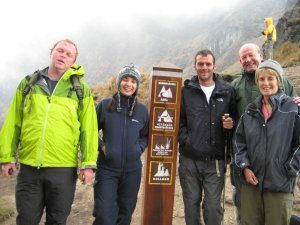 Thanks to Jennifer @ the Adventure Company, Our guide Carlos, and our Porters and Cook (who all had unpronounceable names).